We all know about Electricity energy meters which are installed in everyone’s house or offices to measure the electricity consumption. At last of every month, many of us get worried about the high electricity bill and we have to look at the energy meter once in a while. But what if we can monitor our electricity uses from anywhere in the world and get an SMS/E-mail when your energy consumption reaches to a threshold value. Here we are building an IoT based Project of Energy Meter. Previously we have built a Energy Meter circuit which sends you SMS about the bill using GSM module. 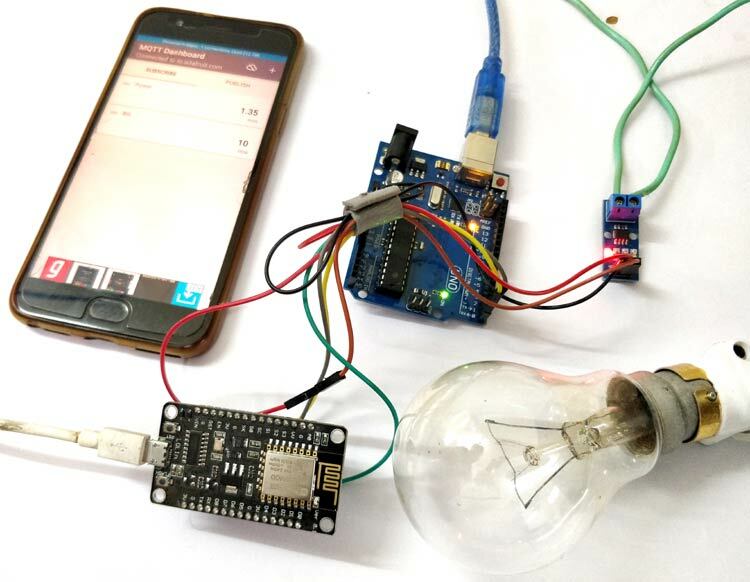 In this project we make a Smart Electricity Energy meter using Arduino and ESP8266 Wi-Fi module which can not only sends you a SMS/Email of your electricity Bill but also you can monitor the energy uses anytime and from anywhere in the world. Here we have used a Current Sensor ACS712 to measure the energy consumption, we will discuss about it shortly. We will take help of IFTTT platform to link our Wi-Fi to SMS/E-mail notifications. We will also use MQTT Dashboard Android App to monitor our Energy uses. So Lets Get started…. Before we start building the project it is very important for us to understand the working of the ACS712 Current sensor as it is the key component of the project. Measuring current especially AC current is always a tough task due to the noise coupled with it improper isolation problem etc. But, with the help of this ACS712 module which was engineered by Allegro thing have become a lot easier. This module works on the principle of Hall-effect, which was discovered by Dr. Edwin Hall. According his principle, when a current carrying conductor is placed into a magnetic field, a voltage is generated across its edges perpendicular to the directions of both the current and the magnetic field. Let us not get too deep into the concept but, simply put we use a hall sensor to measure the magnetic field around a current carrying conductor. This measurement will be in terms of millivolts which we called as the hall-voltage. This measured hall-voltage is proportional to the current that was flowing through the conductor. The major advantage of using ACS712 Current Sensor is that is can measure both AC and DC current and it also provides isolation between the Load (AC/DC load) and Measuring Unit (Microcontroller part). As shown in the picture we have three pins on the module which are Vcc, Vout and Ground respectively. The 2-pin terminal block is where the current carrying wire should be passed through. The module work on +5V so the Vcc should be powered by 5V and the ground should be connected to Ground of the system. The Vout pin has an offset voltage of 2500mV, meaning when there is no current flowing through the wire then the output voltage will be 2500mV and when current flowing is positive, the voltage will be greater than 2500mV and when the current flowing is negative, the voltage will be less than 2500mV. We will be using the Analog pin of Arduino to read the output voltage (Vout) of the module, which will be 512(2500mV) when there is no current flowing through the wire. This value will reduce as the current flows in negative direction and will increase as the current flows in positive direction. The below table will help you understand how the output voltage and ADC value varies based on the current flowing through the wire. Now, that we know how the ACS712 Sensor works and what we could expect from it. Let us proceed to the circuit diagram. We have used this sensor to make Digital Ammeter Circuit using PIC Microcontroller and ACS712. Connect Rx of ESP12 -> Tx of Arduino. Connect Tx of ESP12 -> Rx of Arduino. There is one analog pin available in NodeMCU (ESP12), we could use that pin but ESP series can take upto 3.3 volts on their pins. As we are using current sensor which can give upto 5 Volts so, it can damage our Wi-Fi module that’s why we are not using standalone NodeMCU. To make output of current sensor 3.3V instead of 5V, we cannot use voltage divider circuit between Current sensor and analog pin of NodeMCU because as we discussed above about the current sensor that at 2.5Volts output, current is 0Amp. So, Arduino will read the current sensor value through analog pin and send it to the Wi-Fi module ESP12 using Serial communication. Use voltage divider circuit at receiver pin of NodeMCU so that receiver pin can get upto 3.3 Voltage level. Setting up an AdaFruit account for storing Electricity meter readings. Codes for Arduino and ESP12 Wi-Fi module. Step 1:- Login to Adafruit IO with your credentials or Sign up if you don’t have an account. Step 3:-Click on Actions and Create a New Dashboard. Step 4: Give name and description to your feed and click on Create. Step 5: Click on Key button and note down the AIO Keys, we will use this key in our code. Step 6: Click on ‘+’ button to create a new block and click on Gauge to display Energy uses level. You can also use simple text box to display energy. Step 7: Now, Enter Name of Feed and click on Create. Then Select the feed and click on Next step. Step 8: In block settings, fill the min. and max values as 0 and 100 respectively or you can modify as you want. Step 9: Your Power feed is successfully created. Now, create feed to display Bill by clicking on “+” sign. Now, we have to link AdaFruit IO to SMS/E-mail using IFTTT. Step 1: Login to IFTTT with your credentials. Step 4: Search AdaFruit and click on it. Step 5: Click on Monitor a feed on AdaFruit IO. Step 6: Choose Feed as bill, Relationship as ‘equal to’ and the threshold value at which you want an E-mail. Click on Create action. I have used 4 as my threshold trigger value. Step 7: Click on +that. Search for G-mail and click on it and Login with your g-mail credentials. Step 8: Click on send yourself an email. Step 9: Write your subject and body as shown and click to create. Step 10: Your ‘recipe’ is ready. Review it and click on finish. Now, we are done with web integration. Let’s move on coding part..
We are using serial communication between ESP12 and Arduino. So, we have to write code for both Arduino and NodeMCU for transmitting and receiving. Complete Arduino code is given at the end of this tutorial. We will use library for Current sensor which can be downloaded from this Link. This library has inbuilt function to calculate current. You can write your code to calculate current but this library has accurate current measuring algorithms. Make an array to store power for sending it to NodeMCU. Create an instance to use ACS712-30Amp at PIN A0. Change First argument if you are using 20Amp or 5 Amp variant. In setup function, define baud rate of 115200 to communicate with NodeMCU. Call sensor.calibrate() function for calibrating current sensor to get accurate readings. These lines convert power into Wh. Write this character array to serial buffer using Serial.write(); function. This will send Wh value to NodeMCU. For this we need AdaFruit MQTT library which can be downloaded from this link. We will edit this code according to our AIO keys and Wi-Fi credentials and incoming serial data from the Arduino. First, we included all the libraries for ESP12 Wi-Fi Module and AdaFruit MQTT. We define the SSID and Password for your Wi-Fi, from which you want to connect your ESp-12e. This section defines the AdaFruit server and server port which is fixed as “io.adafruit.com” and “1883” respectively. Replace these fields with your username and AIO keys which you have copied from AdaFruit site while making the Feed. Then we have created an ESP12 WiFiClient class to connect to the MQTT server. Setup the MQTT client class by passing in the WiFi client and MQTT server and login details. Setup a feed called 'Power' and ‘bill’ for publishing to changes. In setup function, we connect Wi-Fi module to Wi-fi access point. In loop function, we will check for incoming data from the Arduino and publish this data to AdaFruit IO. This function check for the incoming data from the Arduino and store this data into watt array using serial.read() function. atof() function convert the characters to float values and we will store this float value in another float variable watt1 . Calculate bill amount by multiplying power (in Wh) with energy tariff and divide it by 1000 to make power in KWh. Now we can publish stuff! This will publish electricity bill to the bill feed. Our bill amount may change fast but IFTTT takes time to trigger the applet so these lines will give time for triggering so that we can receive threshold email. Change the bill_amount value on which you want to get email. Also, change in the IFTTT AdaFruit IO setup. Complete Code for Arduino and NodeMCU ESP12 are given at the end of this tutorial. Now, upload the codes to both the boards. Connect your hardware as shown in the Circuit diagram and Open io.adafruit.com. Open the dashboard you just created. You will see the Power consumption and electricity Bill is updating. When your bill reached to INR 4 then you will get an email like this. You can use Android App for monitoring the values. For this download the MQTT Dashboard android app from the Play store or from this Link. Step 1: Open the App and click on “+” sign. Fill Client Id anything you want. Server and port remain same as shown in the screenshot. You will get Username and password (Active key) from the AdaFruit IO dashboard as shown below. Active Key is your password. Step 2: Select Electricity Meter and select Subscribe. In subscription, give friendly name and topic. Topic format is ‘yourusername’/feeds/’feedname’ and click on create. Step 3: In the same way, make subscription for bill feed. Step 4: As your appliances consuming energy, updated values will be displayed under the Power and Bill. This is how you can create a Smart Electricity Energy Meter, which can be not only monitored from anywhere in the world but also trigger Email when you have high Electricity consumption. Also check our all the IoT Projects. can you tell me the wifi receiving range of nodemcu esp8266? do we need a voltage regulator for the circuit? What are the values of resisitors? in above circuit is the voltage divider necessary and if so what are the value of resistors? i have a 2.2k resistor instead of 2k.when i kept the value of r1=1k and r2=2.2k it gave me a vout of 3.4375 as the input voltage was 5v.and in the above circuit description the node mcu takes upto 3.3v.so is it safe if i use the resistor combination i have for creating voltage divider? Can u suggest the code for storage of last electricity consumption value even if the setup is power off and generating the bill by using last and current value. the values are not getting updated on adafruit dashboard.i also checked it in the mqtt android app and it does no get updated.it just shows N/A. Unable to get correct data at NodeMCU side, it is always showing 0.0. Anybody who have done this project please share the sketch for same. If u completed please let me know, i need your guidance. Please share the exact working circuit diagram. Tell me whether there is a need for a transformer or not. For creating block of "Bill" on dashboard, do we have to use "Text" block type?